Croatian match racer Tomislav Basic (TB Race Team) today vaulted to the top of the leaderboard at Match Race Germany. Basic’s 9-2 win-loss scoreline secures his place straight the Semi Finals, while the six next teams will compete in a compressed Quarter Finals round, the top 3 skippers of which will join Basic in the Semi Finals. 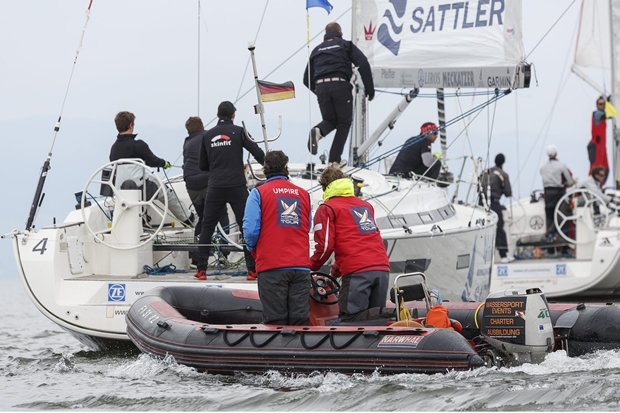 Making the cut for the Quarter Finals were Eric Monnin, SUI (Team SailBox), Matt Jerwood, AUS (Redline Racing), Joachim Aschenbrenner, DEN, (Aschenbrenner Racing), Mark Lees, GBR (GBR Match Racing), Reuben Corbett, NZL (Corbett Racing) and local ‘Lake Constance’ hero Tino Ellegast, GER (Team Ellegast). Heading home after a disappointing day were Poland’s Przemyslaw Tarnacki (Energa Yacht Racing Team) and Hamburg sailor Tim Kröger (New Wave by adidas). Kröger was awarded a Wild Card for the event and assembled a young crew for the week “My young crew mastered the challenges well this week and have learnt a lot to work with for the future,” he said. Also for 24 year old Max Trippolt from Bregenz, his results were not enough to make the Quarter Finals finishing in eighth place on countback.